This is an interesting Munro with an easy walk in but followed by a steep climb and some rocky steps. There are fine views across to Ben Vorlich and the Arrochar hills. Start at the large CP on the E side of the A82 at NN323098, close to the Inveruglas power station. Take the path by the roadside SSW and turn W just before Inveruglas Water. Pass under the railway bridge and follow the track to a junction at NN298096. Trend SW for 500m and then take a path at NN295094 which, at first indistinct, leads to a well defined and eroded path generally NW to the summit of Ben Vane. Care will be needed with a few rocky steps. There is an interesting cave formed by a large overhanging rock at NN286095 which would afford some shelter in bad weather. Return from the summit by the same route to the CP. Grade: S; distance: 15km; height to climb: 970m; map(s): LR56, EX364, OL39. Meet at Glencoe village car park at 8.30am, for start of walk at 9.45am. Leader: Nigel Clark 07555 812970. Two small craggy hills, surrounded by delightful lochans, with great views over Loch Sunart. Start at the CP on the B8007 at NM650606. Cross the road and head N up through a short section of woodland on to the open hillside. Continue N following the broad ridge, rocky in places, to the summit of Ben Laga 512m. Descend NW to visit the largest lochan, then E to the four smaller ones. Descend NW to the head of Loch Laga. Cross the two burns feeding into the loch, cross a track near a junction, then head NW uphill on the right side of the 2nd burn and continue to the summit of Meall nan Each, 490m. Turn back S, over Leac an Fhidhleir, then down an illdefined and undulating ridge to reach Lochan a’Chrom-leathaid. A new fence has been erected here enclosing land which has been planted with native trees. Pass through the gate at NM628623 and continue S over Leac an Tuairneir and down its undulating S ridge to the fence at NM627611. Turn E and descend the flank on a rough track to exit the planted area at a gate, and continue to the B8007 at the settlement of Laga. Head E on the road back to the start. Grade: M+; distance: 12km; height to climb: 763m; map(s): LR40, EX390. Meet at Corran Ferry slip for 8.45am sailing, for start of walk at 10am. Leader: Sally Cameron 07810 464994 or 01631 740391. 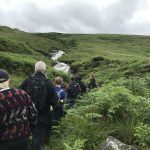 Full walk details at www.nevis hillwalking.club. 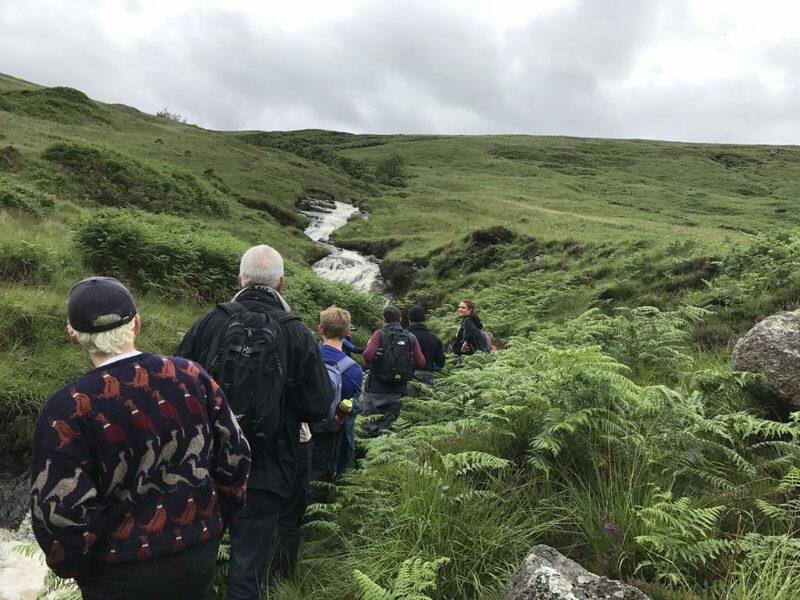 If anyone would like to go out on the walk please contact club secretary Suzanne Theobald on 01397 701783 or email enquiries@nevishillwalking.club. A useful hilltrack gives easy access to this hill, a fine viewpoint above Loch Creran. The return route down the E ridge leads into a remote coire. Start on the minor road just N of Druimavuic, NN009451, where parking is available. Take the track through the woods past Druimavuic House to the open hillside. The track now continues uphill, following the line of the Allt Buidhe and eventually reaches the bealach at the head of Coire Buidhe. Turn SW, and continue over Creag na Cathaig, 662m. Climb steeply up to a summit at 804m. The main summit of Creag Bheinn lies about 1km to the SW. Head SSE for 430m to a tiny ring contour on a small summit at NN025418. Turn E and descend a steep ridge, curving NE to about 600m altitude. Turn N into the coire and contour around it to reach the col SW of Creag na Cathaig, NN035432. Head N down into Coire Buidhe, cross the Allt Buidhe where convenient and regain the track back to Druimavuic. 13km, 850m ascent; both Corbetts 14km, 1220 ascent. Suggested and coordinated by John Burton.